The original Georgian Staff Room in the basement of the medieval house is now our Museum and Gift Shop. 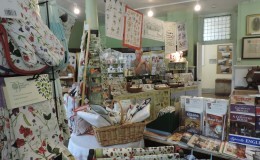 We have a lovely selection of presents from our own range of custom made gifts to locally made jams, marmalades, sauces, books, toys, cards, melamine trays, padblocks and pretty porcelain boxes. 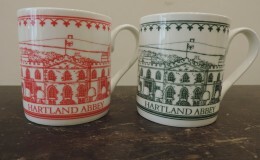 Our popular Hartland Abbey range consists of wool fat soap, postcards, notebooks, mugs, tea towels and thimbles. We have a huge range of tea towels and co-ordinating kitchen items from mugs to aprons and oven gloves in lovely new designs by Madeleine Floyd and others and humorous prints by Annie Tempest. Our Canns Down Press art cards and Natural History Museum cards are very popular as are our PineFeroda art cards produced by local artists in woodblock prints of dramatic coastal scenes. 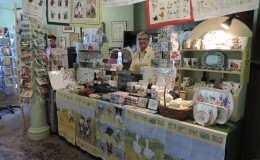 Their work can also be seen and bought in Hartland. Most of our gifts are in keeping with the history and natural life all around us.